To help get be back into the blogging groove, I’m trying out The SITS Girls daily writing prompts. Today I am supposed to discuss what my superpowers would be… if I actually had them. If I were a superhero I think I would be Dessert Girl! As Dessert Girl I would have the power to turn anything I touched into a fresh, fabulous dessert. And the great part would be that it would only work when I wanted it to work, so I could still touch things. I am fairly certain that if I ran a log of what kinds of desserts I created (with my mind) I would end up with a large amount of cheesecake. 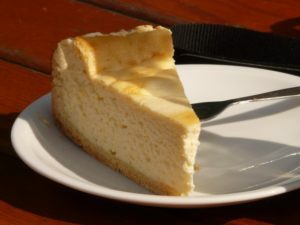 I can eat cheesecake every day — plain, with caramel, with nuts, with fruit, with whipped cream. All kinds. Oooohhh… that sounds good too. But I think I’ll stick to my Dessert Girl powers.